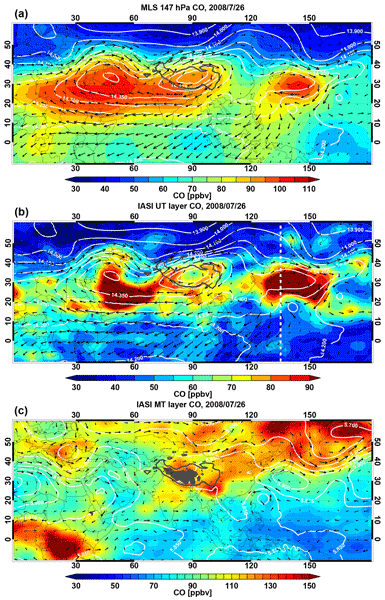 We analyze upper tropospheric CO and O3 using satellite data from limb-viewing (MLS) and nadir-viewing (IASI and OMI) sensors, together with dynamical variables, to examine how the two types of data complement each other in representing the chemical variability associated with the day-to-day dynamical variability in the Asian summer monsoon anticyclone. The results provide new observational evidence of eddy shedding in upper tropospheric CO distribution. Although the principal mechanisms responsible for the formation of the Antarctic ozone hole are well understood, the factors or processes that generate interannual variations in ozone levels in the southern high-latitude stratosphere remain under debate. This study finds that the SST variations across the East Asian marginal seas (5° S–35° N, 100–140° E) could modulate the southern high-latitude stratospheric ozone interannual changes. 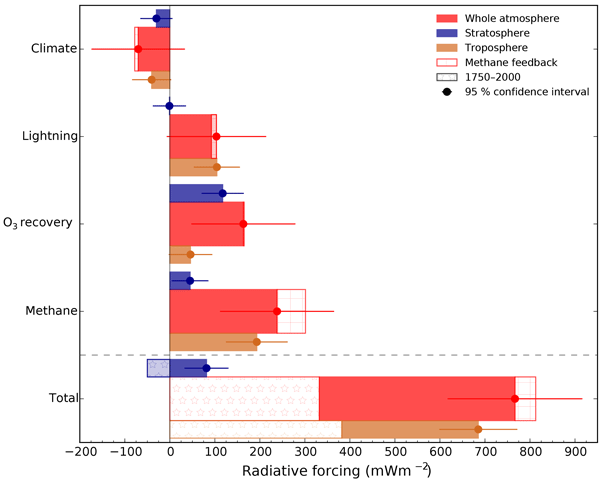 This study explores future ozone radiative forcing (RF) and the relative contribution due to different drivers. Climate-induced ozone RF is largely the result of the interplay between lightning-produced ozone and enhanced ozone destruction in a warmer and wetter atmosphere. These results demonstrate the importance of stratospheric–tropospheric interactions and the stratosphere as a key region controlling a large fraction of the tropospheric ozone RF. Global warming will persist in the 21st century, even if the solar activity undergoes an unusually strong and long decline. Decreased ozone production caused by reduction of solar activity and change of atmospheric dynamics due to the global warming might result in further thinning of the tropical ozone layer. Globally, total ozone would not recover to the pre-ozone hole values as long as the decline of solar activity lasts. This may let more ultra-violet radiation reach the Earth's surface.